Usually, when we think of art galleries, we think of painting on canvases, but that’s not the case for the “Uncommon Materials” exhibition at California State University, Dominguez Hills. 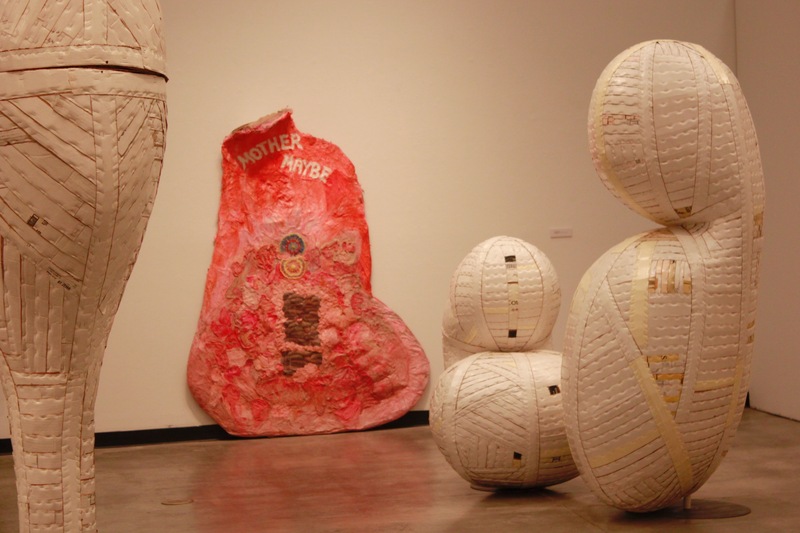 Commonly overlooked or discarded materials such as used fabric, napkins, cardboard and house paint are integral parts of The Department of Art and Design’s exhibition, which runs through Dec. 6 in the University Art Gallery. “Uncommon Materials” features artwork from Los Angeles artists Aubrey Ingmar Manson, Garry Noland, and Ann Weber. Curator Jim Keville, who is also an associate studio art professor, said interest in each individual artist sparked the idea for the group show. Each of the three, he said, offers a unique perspective in their common bond of using unusual materials. While each use found cardboard in their works, Mason complements it with fabric, napkins, and house paint, while Noland integrates scraps of materials ranging from PVC pipe and foam to old wood. Weber’s specialty is in re-imagining cardboard pieces she finds in store dumpsters. All the artwork shown in the exhibit is mixed in with each other giving it a balance of creativity, meaning it doesn’t focus on one specific material, Keville said. He wanted the artwork to speak for itself and not to separate each artist’s work, since though artists may work with similar material, their creations are original enough to stand out. “I also really wanted to include those cardboard pieces that Garry Noland made because he’s using the material in such a different way than Ann Weber using the same material,” Keville said. Then there were pieces from the artists that used unbelievable material that wouldn’t typically be thought of when creating art, Keville said. Weber’s inspiration started in 1991, when, as she was moving her studio, she realized there was much cardboard left over, and came up with the idea of making a sculpture out of the boxes. Weber said she got another idea when she was leaving the hardware store and saw someone stapling a receipt to a plastic bag. Noland said he is less inspired by making a specific piece of art than he is with constantly working. He said the work he creates is done long before he knows which shows they will be displayed in. He also keeps his studio messy in a sense that if materials on the floor catch his eye, he can assemble it creating new artwork. The exhibition will be open until December 6. The art gallery hours are Monday through Thursday 10 a.m. to 4 p.m.